In light of the upcoming holiday deals and savings, this ultimate guide will help decide if a compression sock or sleeve is best for you, or the person you want to give compression to. There are a few differences between the two and knowing which one works best for your needs will help clear some confusion. 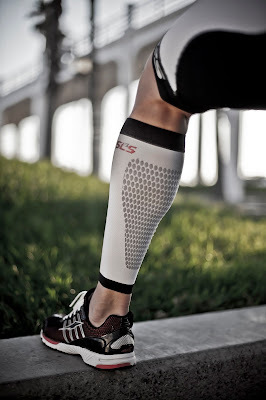 Whether you race triathlons, go on short runs, or take long bike rides, compression is effective at getting the most mileage out of your legs with the least amount of effort. The difference comes between the main uses for both. Compression socks can be worn for your race and recovery, which means you can keep them on hours after you crossed the finish line. Keeping socks on for recovery is also recommended. Socks help reduce the amount of lactic acid in your legs and help blood circulate easier, which means the period where you’re oohing and aahing trying to get out of chairs or climb stairs is reduced. Compression sleeves can be worn for a race or run, but they should be taken off soon after you cross the finish line. This is because compression sleeves lack the foot part that socks have, so leaving them on post-workout can have detrimental effects. Wearing compression sleeves after you have stopped being active can lead to swelling of the feet and ankles and may cause blood clots. Compression sleeves are great while being active, but they are not meant for recovery. Compression sleeves can help dramatically reduce time in the T1 transition of a triathlon. Since there is no foot part, you can easily wear these under your wetsuit and after you peel off your wetsuit you are ready to race. Do you have favorite socks? Most runners have ankle socks they prefer to wear, or lucky socks, sleeves give you the benefit of being able to wear your favorite running socks without losing out on the effectiveness of compression. Compression sleeves are easier to put on. It can be a real fuss sometimes to put on compression socks and if you are trying to save some time or don’t want to struggle with socks, compression sleeves might be the best option. Versatility! Compression socks are not just for athletes, they can be worn for: nurses, pilots, doctors, travelers, flight attendants, bus/taxi drivers, office/warehouse workers, teachers, retail salespeople, restaurant workers and expectant mothers. The list can go on and on, but to sum it up, if you are standing for long periods or traveling frequently, compression socks will be your best friends. Recovering sooner than later. Compression socks can be left on post race, which is great for recovery. If you aren’t racing or running, they can help your sore legs recover from a long shift at work. They limit swelling and lactic acid in your legs. Whichever one you feel is best for you, both have amazing universal benefits. Sleeves and socks protect your legs from poison oak and ivy, help prevent scratches from any brush on the trail, keep your legs warm or cool, protect you from dirt, protect your legs from the sun, limit the chance of shin splints, and both have the benefits of compression. Make sure you know the calf size of the person for whom you are purchasing. Socks will always have shoe size listed, but for the most accurate fit calf size is the more important parameter. If the person who will be wearing the socks or sleeves already has leg swelling, it’s recommended to get the doctor’s approval before wearing compression. Lastly if buying for someone else, always look at the return and exchange policy just in case.